It appeared like a really short line for the noodles when we arrived just past midnight, and that was only the beginning. It took about 15 minutes to get to place your order then it’s another 45 minute wait for the noodles. This place is known for its – you guessed it – fishball noodles. 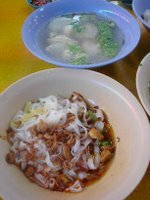 More specifically, it is known for its fish dumplings: minced fish wrapped in a thick skin, also made from fish. The taste is different – flavoursome without being fishy, and juicy to the bite. 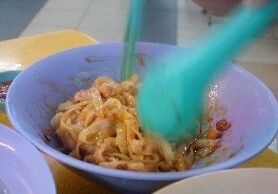 We had it with kueh teow (flat rice noodles) “dry” which was served with a nice light chilli sauce and vinegar. Quite a nice compliment. Great stop for a late night bite (opens for dinner till early morning), if you don’t mind the queues.